Today, how many times did you ask your clients about their sleep? If the answer is "none," you may be missing a critical diagnosis…. 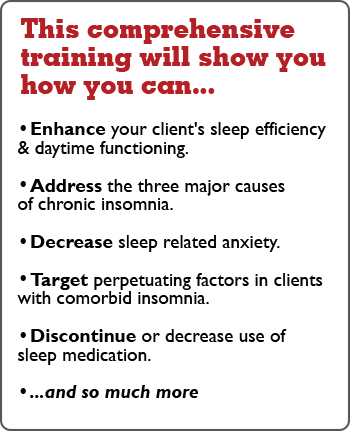 Up to 80% of your clients may meet the criteria for clinical insomnia. And missing this diagnosis could slow or even halt your therapeutic progress with clients suffering from depression, trauma, anxiety, or chronic pain. The good news? There's a safe, evidence-based approach that you can easily apply to your clinical practice: Cognitive Behavioral Therapy for Insomnia (CBT-I). The bad news? There aren't enough CBT-I trained clinicians! Be part of the solution! 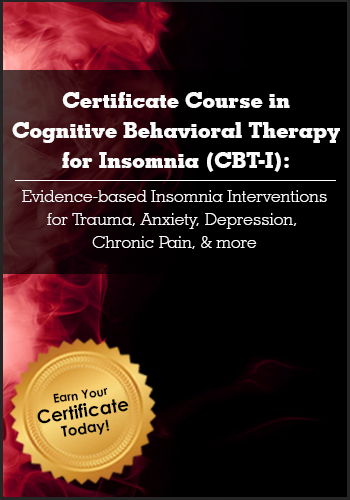 Now you can advance your practice with specialized training and earn your Certificate in Cognitive Behavioral Therapy for Insomnia through this breakthrough online course. Join two of today’s leading sleep specialists and treatment innovators, Colleen E. Carney, Ph.D., and Meg Danforth, Ph.D, for step-by-step instruction on applying CBT-I in a clear, systematic session-by-session approach that is proven to effectively treat insomnia— long after treatment has ended. You’ll finish this comprehensive training with your Certificate in CBT-I, and you'll be armed with tools you can easily integrate and immediately apply into your next clinical session. Earn up to 19 CPD Hours — included in the price! Get instant access to all three parts of the comprehensive training plus the FREE Bonus — all designed to help you effectively integrate Cognitive Behavioral Therapy for Insomnia into your practice. There is no expiration date on accessing the online course – it’s yours to keep forever and view at your convenience! Instantly collaborate with other professionals on the course materials through interactive message boards, and complete your online CPD tests directly in the portal to earn up to 19 CPD Hours! In Part 2, you'll learn how to apply CBT-I with clients struggling with depression, anxiety, PTSD, Traumatic Brain Injury (TBI), and chronic pain. You'll learn how to troubleshoot adherence, explore the challenges associated with implementation of CBT-I and discover how you can adapt the therapy materials to meet the unique needs of your individual clients. In Part 3, you'll get strategies for detecting and safely treating clients with co-occurring sleep disorders such as sleep apnea. You'll also discover how to use case formulation to guide your assessment and treatment decisions when using CBT-I in practice. Enroll today and you'll get these FREE BONUSES (A $79.98 value)! Cognitive Behavioral Therapy (CBT) has been an effective intervention for decades, but few clinicians have discovered the powerful treatment results of combining CBT with Mindfulness. In this practical, engaging skills manual, you'll review the principles of CBT and then get steps for effectively integrating mindfulness practices into therapy. Straight-forward explanations and dozens of worksheets provide fresh insights and new tools to move therapy forward when treating stress, anxiety, panic, depression, pain, trauma, addictions, and other issues. Join Colleen E. Carney, Ph.D., and Meg Danforth, Ph.D., for a recorded Q&A call where they'll address questions from course attendees and share additional insight into applying CBT-I to practice. Speaker Disclosures: Financial: Colleen Carney is a professor at Ryerson University. She receives a speaking honorarium from PESI, Inc. Nonfinancial: Colleen Carney is a member of the Canadian Psychological Association; and the Association for Behavioural and Cognitive Therapies (ABCT). Meg Danforth, Ph.D., is a licensed psychologist and certified Behavioral Sleep Medicine Specialist who has been helping people sleep better without medication for the past 15 years. She is a clinician and educator at Duke University Medical Center in Durham, NC. As the Director of the Duke Behavioral Sleep Medicine Clinic, she provides advanced clinical care to patients with sleep disorders and comorbid medical and mental health issues. She also provides clinical training and supervision to psychology graduate students, interns, and fellows. Dr. Danforth is committed to teaching clinicians from a variety of backgrounds to deliver CBT-I in the settings in which they practice. Her work has been featured in the Associated Press and CBS News. Speaker Disclosures: Financial: Margaret Marion Danforth is a clinical associate at Duke University Medical Center. She receives a speaking honorarium from PESI, Inc. Nonfinancial: Margaret Marion Danforth is a member of the Association for Behavioral and Cognitive Therapies. "I have been practicing CBT for 25 years, already had long used sleep restriction and sleep hygiene interventions with patients and have taught many doctoral students these strategies over the last two decades. However, even with a more than average background and experience in the area, I learned so very much that will translate into better patient care and graduate student training. You have a very effective teaching style that is organized, engaging, research-based and directly clinically applicable. Yours was one of the best CE workshops I have ever attended after more than 20 years of being licensed." "What an amazing workshop... you two are a dynamic duo!!!!" "By far the best training I have ever attended. The presenters were very knowledgeable, personable, and engaging. Very thankful for being able to attend and looking forward to utilizing knowledge gained in my practice." "Amazing seminar! Meg and Colleen were awesome. Case formulation was great and very relatable." "Unique and masterful! Invaluable seminar that will enhance my clinical work. Many thanks!" Watch your email for your order confirmation, and get instant access to all three parts of the comprehensive training plus the FREE Bonus — all designed to help you effectively integrate Cognitive Behavioral Therapy for Insomnia into your practice. Review all the course materials at your own pace and at your convenience! Click here for course objectives and outline. Instantly collaborate with other professionals on the course materials through interactive message boards. You'll be part of a community of hundreds of practitioners all focused on understanding CBT-I, providing valuable opportunities to share insight and experiences and to build your professional network. Complete your online CPD tests and earn up to 19 CPD Hours! Click here for total course CE Credit.